FYI: Revised thread and challenge title. I didn't get a picture of the lot I made. But I played through one week. I played where the sim I was controlling got to spend the money made on the days they were active. 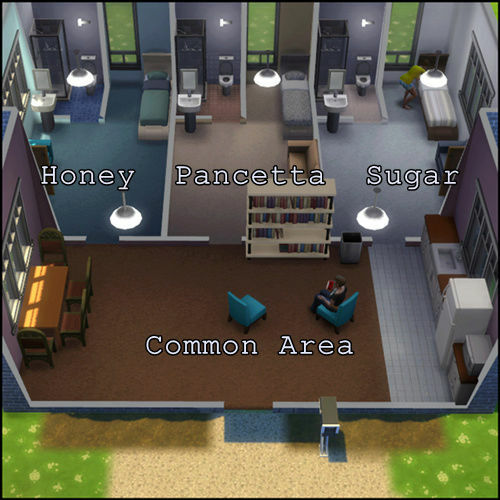 I am having them work on building a community type shared building to put skill objects in. One funny thing that happened was my hot headed sim kicked over the trashcan, while my active sim was at work, and the slob sim would go out and play in the trash and get dirty and then go in and take a bath, but his fun was so low he'd go right back out and play in the trash until he got dirty and, well he repeated the process several times..
Oh my goodness. LOL what a hot mess you had going on there! My solution because with all this waste going on, it's going to take forever to save up any money to buy anything! Remove the stoves and refrigerators from both the boy's homes. Maranda will do all the cooking from here on out and I'll put the tables that are in the boy's homes outside. Then I'll open Maranda's fridge and put food out for the boys to eat. @EuphorialQueen would it be allowed or considered cheating if I (not Maranda)was to put food on the table when I'm not in control of her? Even with a common cooking area the waste is horrendous! Even with empty counters they pull out ingredients and just put it on the floor! I heartily endorse your solution to have one cook and the Magic Hand ( ahem ) can make food teleport from the fridge to the table. Good to know that my solution to the problem of wasted food is a to go. 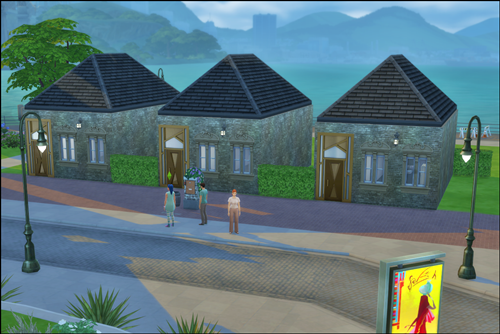 This was built on a 20x15 lot in Newcrest. I have an idea for a different version but I wanted to get into the challenge to play! If I could of swatted Matt on the head I would of! (don't know if you're familiar with NCIS and "the Gibbs" thwack to the head, but that's what Matt would of got. Gibbs is my all time favorite character on there. Played some more today, but I don't think I like the lot I chose or it's set up. There was no limit on lot size was there? Just as long as we could make 3 homes? Okay, so I moved my sims to the city. I am not sure yet if this was a good or bad choice. I gave them each a identical home. I am going to eventually make them brownstone style homes. Each will spend their daily earnings on their own home so it will be fun to see who gets their home built first. I am going to have to keep track of money in a note book. I think I can do it okay. It might make it more engaging for me. I like how you said it could be optional. 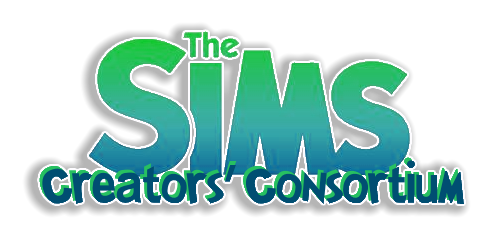 Some simmers like to control everything were others just like to wing it. so it can work for both. They had 1$ left over. Is that the Salt House lot? Love that location. Those doors are one of my favorites. 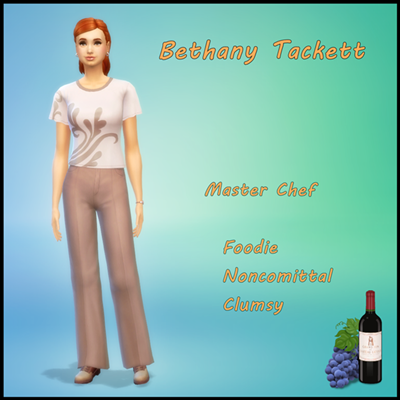 Yes, I thought it'd be fun to try the city since the one sim has social networking job and the other loves to cook so she can learn some new recipes. That door was really cheap! I was surprised. This is quite a challenge. So fun to read about your experiences and how you're each playing the challenge. I agree @Gramcrackers, each of us with our very different households each play the challenge different and it's fun to read each one to see how they are fairing...faring... you get the point. I have been lazy about playing these last couple of days. Hopefully I can get things in order so I can play. I must say ... time is so fast (In game) before it is time to rotate. Oh I know! Thankfully I've been writing each day down or I just know I'll forget who is on what day! I've been meaning to ask and probably should do it now while it is on my mind. 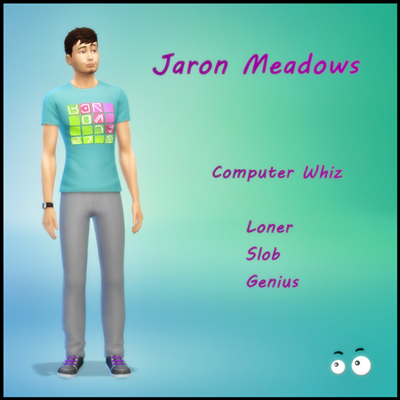 Is it allowed to change the whole households everyday clothing when assigning clothing to the sim that is being controlled? Yes you may update the whole household at once. So doing individual kitchens is not really working out. I have also discovered they need like three empty counters? That or my game is buggy. They wasted so much money and food last night when I played. I am thinking of making them live in tents and only have a cooler again. I am going to see if I can get them under control today! Here's another thought. If you do not have a common room for the three of them to share you may not be able to entertain any visitors or have any kind of group gathering. At least not without some degree of difficulty. 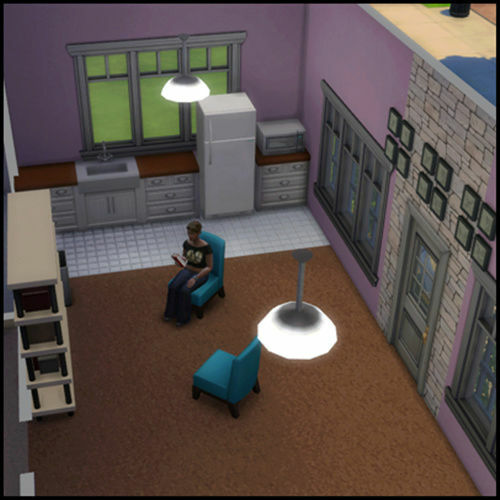 Since each unit is locked for one of the individual Sims that is the only one that can get into that area. Also with three individual units the game will pick one of them to be the front door for the lot. That also means that anyone visiting will only be able to knock on that door to gain entry. Possible solution for the door anyway is to just have a single door on a wall at the front of the lot to serve as the front door. That way your visitor will knock on that door and you can invite them in to the common area which could either be the yard or another room. As for the kitchens oh my goodness ! I feel you on having three kitchens it's terrible! I think for the purpose of this challenge one of the tweaks that I think all three of us have made or are going to make is to have one common kitchen for the three of them to share. What do you think? @Pallystyle, I had the exact same issue, so because Maranda is the "foody" or Glutton of the bunch, when I'm in control of her because one of her daily tasks for work is to make food or mix drinks, I have her cooking her little head off which allows me to stock her fridge with a variety of meals. Then I removed all counters, fridges and stoves from the boys homes, I then put food out on their tables (which I also moved to the outdoor, I probably didn't have to do that but it just makes it easier and I can just put one thing out) for all of them to share. Kind of like having a outdoor common dining area. Since doing that, I haven't had the waste of uncooked or uneaten food and waste of money. The one door for guest is an awesome idea! I think the common dining/kitchen area is a good remedy. So far with just Maranda being in charge of the food, I haven't had the waste that was going on before. I will have to try and see how it works with a common kitchen area and report back on my findings. I love that idea. And to add to it you can either Call to Meal or form a household group and Grab a Plate Together. The girls are making career progress but I am still tweaking a few things on how I am organizing their activities. Their kitchen has a microwave, refrigerator and a sink. That leaves 2 counters. There are still a few instances when ingredients are pulled out and left on the floor. Maybe a 3rd counter would help? Even with a kitchen sink they seem to leave dirty dishes on the table or counter. I have an outdoor trashcan but need to double check for an indoor one. I gave them all a cooler. It helps with the wasted food. But I think a shared kitchen is the way to go. I also noticed that they seemed to want 3 empty counters to make meals. I think this is a bug as I have never seen it before. I noticed they wanted to try and clean up dishes for all on the lots but the locked doors made them break the task. 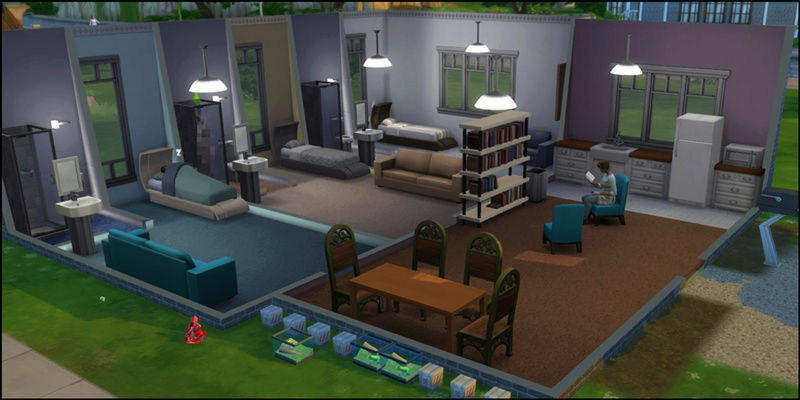 Perhaps instead of an individual house they could each have a special room that fits with their job or something. And perhaps a shared nursery later if any of them have kids. I see your point with the visitors. It would make hosting parties a pain. I think I need to rework my lot....again. Different play styles are important to the process of making an interesting challenge. The key to this stage of the challenge process is finding out what works and what doesn't. Didn't get to play much on my save the past couple of days. I did get to the end of the week. I was thinking about how easy it would be to keep track of earnings and such if I could make some sort of score chart or something. I need to look at my pdf thing and se if I can figure out how to do it.